"The people of God's sharing in the messianic missions is not obtained only through the Church's ministerial structure and sacramental life. It also occurs in other ways – that of the spiritual gifts and charisms." A Life in the Spirit Seminar is a retreat which centers on God the Holy Spirit. Everyday life as a full-gospel Christian. Being open to all the gifts of the Holy Spirit. Allowing the Holy Spirit to work in our lives. Growing in our New Life. What will the Holy Spirit do in my life? Lead me to a better personal friendship with Jesus and the Father. Help me better appreciate the Mass, Jesus in the Eucharist and the Scriptures. Help me to pray more effectively. Lead me to become a better Catholic. Give me boldness to be more active in my parish. Help me be a better parent, neighbor, parishioner, or citizen. Lead me to be all God created me to be. Help me deal with some of my personal problems. Make real the power of the sacraments. Help me lead a happier life. 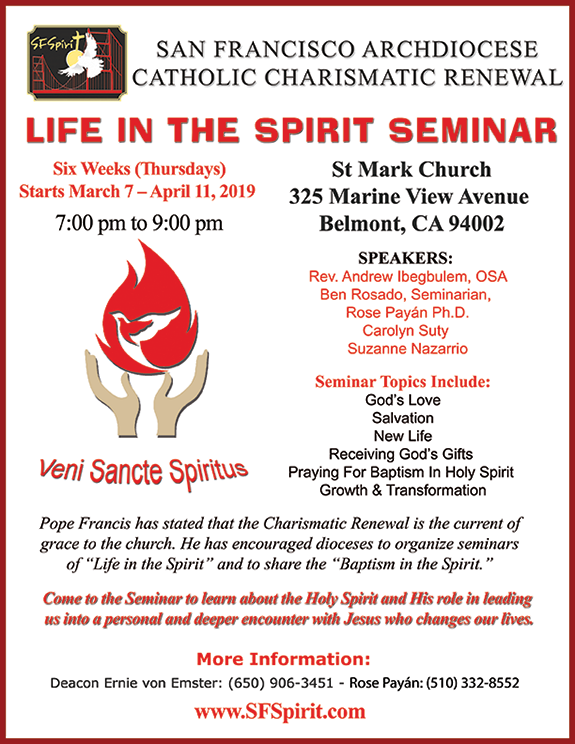 The Life in the Spirit seminar is intended for anyone who desires a new awareness and deeper relationship with God, especially through the working of the Holy Spirit, and to be more fully spiritually equipped in building the Church. Participants are invited to pray for the "Baptism of the Holy Spirit" which was evident in the Upper Room as the Holy Spirit was poured out on the Church at Pentecost. It is an invitation to "stir into flame" in a renewed Pentecost the gift of the Holy Spirit that was given at Baptism and Confirmation. In speaking of the "New Pentecost," Pope John Paul II described it as "a grace directed to sanctify the Church, to renew in her the taste for prayer, and to rediscover with the Holy Spirit the sense of thankfulness, of joyful praise, of confident intercession, and to be converted into a new fountain of evangelization."